The City of Delaware’s 2018-2022 Capital Improvement Plan (CIP), approved Oct. 9 by City Council, proposes various projects that plan architect City Manager R. Thomas Homan is hopeful will come to fruition over the next five years. Homan states the CIP will allow the city to address a number of “important projects” within several departments, including public utilities, technology, and public works. From a public utility standpoint, the plan addresses the need for improved water service on the southeast side by installing a new water distribution line that will cross the Olentangy River. Technology-wise, the plan calls for the replacement of the Delaware Police Department’s record management system, while the Public Works Department will be upgrading the traffic signal system throughout the city’s major corridors. Homan cautions that the proposed work outlined in the five-year plan is dependent on having funds available in the CIP General Fund, which is funded through income tax revenue. While the fund shows a positive ending cash balance in 2018 of $617,262, the fund is anticipated to have negative ending cash balances of $395,769 in 2019, $716,086 in 2020, $700,189 in 2021, and $861,045 in 2022. “Until a new revenue source is identified, tough choices will need to be made on which projects won’t be addressed for 2019-2023,” Homan states in the plan. As for the immediate future, the plan anticipates CIP General Fund expenditures totaling $1,701,277 in 2018, with the majority of the funds allocated toward street improvements ($811,527), technology improvements ($360,100), and equipment replacement ($300,000). The CIP highlights the need for additional funding and notes the failed transportation levy in 2016 would have made available close to $800,000 per year for street resurfacing. On a positive note, Homan states the city has been awarded approximately $17.6 million in state and federal funding for The Point Improvement Project, which will allow for four lanes of traffic to pass under a new railway structure (current one to be replaced) near the intersection of U.S. Route 36/State Route 37. The city, however, must provide a 20-percent match of $6.2 million by 2022. To fund the city’s portion, the CIP reflects a yearly allocation of $350,000 toward the project. Another major transportation project highlighted in the CIP is the East William Street Improvement Project, expected to enter into the construction phase in 2019. Primarily funded through a federal earmark, Homan states the project will help reduce the frequency of rear-end and side-swipe accidents through the corridor by creating a continuous center turn lane on East William Street from Lake Street to The Point. In addition, a new pedestrian bridge — double the length of the current one that spans East William Street near Lake Street — will be installed to widen the intersection and “eliminate the severe blind spot and substandard turning radius” at the northeast corner of the intersection. 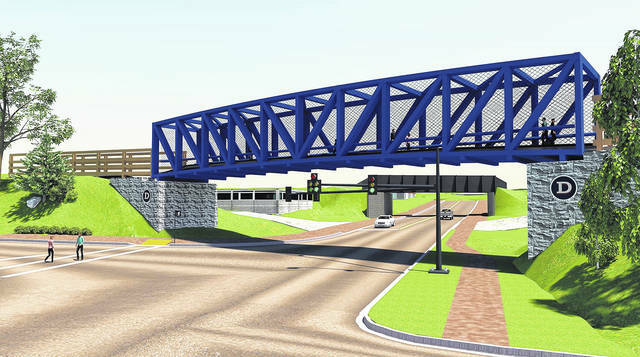 Pictured is an artist’s rendering of the new pedestrian bridge that will replace the current one spanning East William Street near Lake Street in Delaware. The bridge is part of the city’s East William Street Improvement Project, which is expected to begin in 2019 and is included in the five-year Capital Improvement Plan approved by City Council last week.